Consider the earthworm. Ubiquitous, not unfriendly, maybe a little gross–who would think that this humble creature may hold the key to a new generation of soft robots? At the Society for Neuroscience’s annual meeting in Chicago this week, a team of neuroscientists and engineers from Case Western Reserve were on hand to describe their work turning biological research on animal behavior into useful robotics at the university’s Center for Biologically-Inspired Robotics Research. Of particular interest to their lab? Earthworms, which use a type of movement called peristalsis. Plenty of living organisms use peristalsis, but earthworms move using two types of muscles that contract and expand sacs of fluid. This makes the worm grow thinner and longer, or wider and shorter, helping it propel itself. But this type of locomotion isn’t very well understood, as Case Western Reserve’s Andrew Horchler told me this week at SfN. Now, a more complex understanding of those underlying neurological and physical systems is helping him and his colleagues build a robot that replicates those systems on a larger mechanical scale. For example, the earthworm’s “front,” “middle,” and “end” all use unique forms of motion depending on context, thanks to arrays of neurons that let it move in a huge range of ways across its length. That’s exactly what Horchler and his colleagues are replicating across the body of their so-called CMMWorm, a modular robotic worm with an artificial neuronal controller, which can create these varies types of waveforms across its body. There’s a huge range of applications here, from the micro (a safer and less painful tool for medical endoscopies) to the macro (a worm that can tunnel into blocked pipes or investigate dangerous rubble piles). 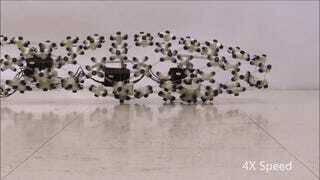 We’ve seen plenty of soft robots this year, but none of them are quite as precisely controlled as this–it’s more like a hybrid of both soft and conventional robots, using mechanical parts and biomimetic brains to create a smarter ‘bot. For more on their lab’s work, check out this page on the CMMW. All images and video courtesy of Andrew Horchler / Case Western Reserve University Biorobotics Lab.